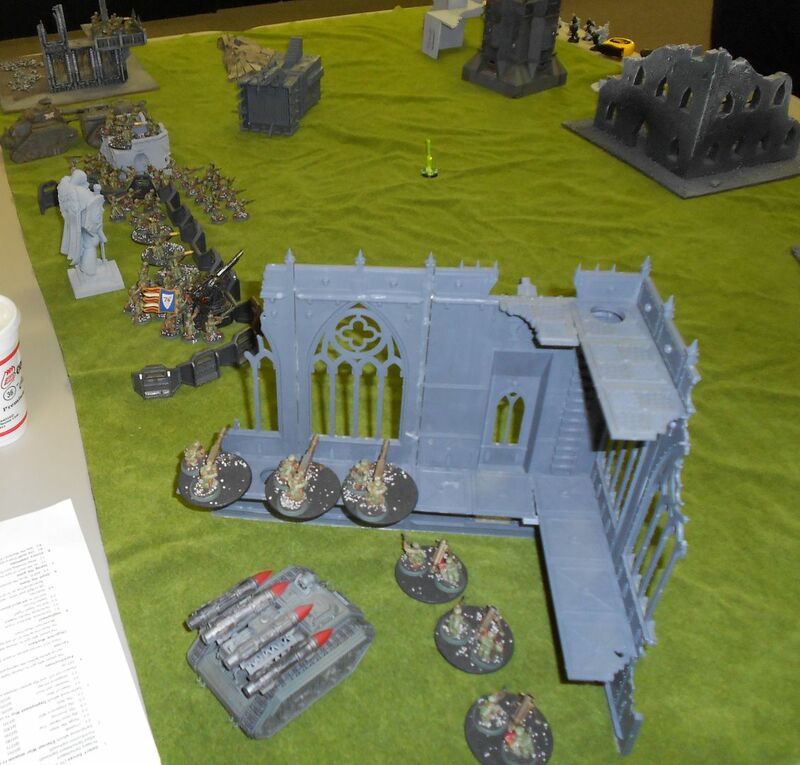 Another league battle report from the league at Gaming Underground, this time vs. Leonard's Orks. 1500pts, Mission: Relic, Deployment: Dawn of War. I set up first and won first turn, but the Orks stole the initiative. They were a sneaky lot indeed, with Snikrot-led Kommandos and an outflanking nob squad in a battlewagon thanks to their warlord trait. The ion storms had continued to lash the planet, playing havoc with sensors, making atmospheric flight dangerous and teleportation impossible. 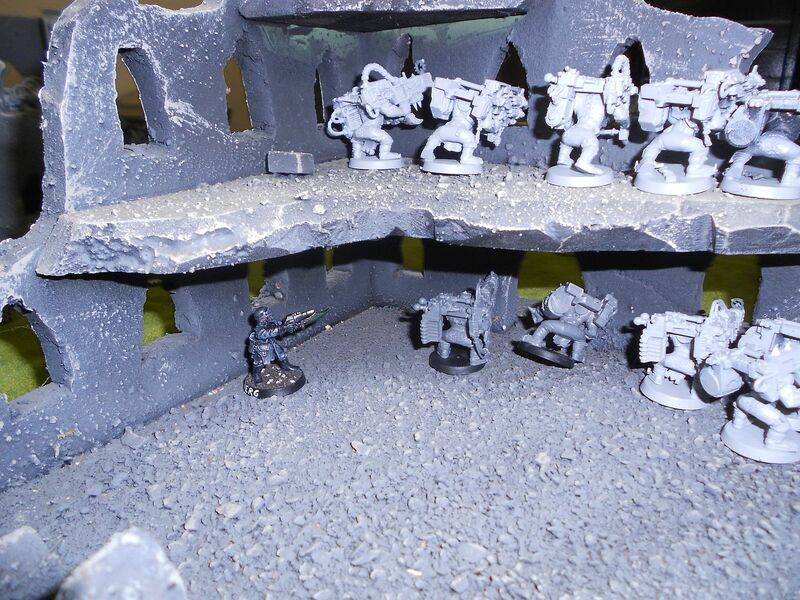 The Imperial Guard forces, under pressure from the Orks, were desperately scouring the ruins of Hive Absolom for communications equipment their engineseers assured them was somewhere within the rubble. With that equipment boosting the signals of locator beacons, Space Marine forces cooling their heels in orbit while the world was lashed by storm and Ork alike could begin teleporting down to the battlefields and begin the rollback of the Xenos. 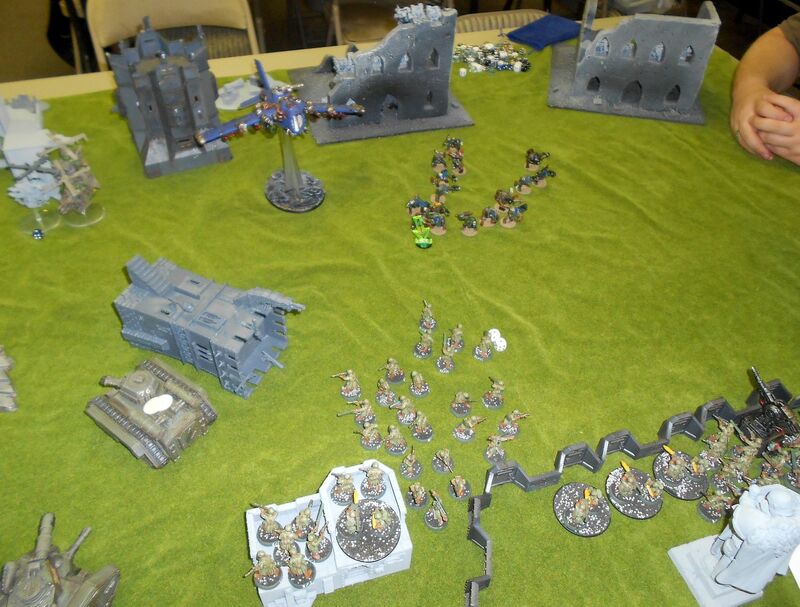 I set up with firepower positioned to pound the area around the relic, and several squads positioned to charge out and secure the item itself. The storm was still thick in this area, hampering visibility as well as sensors. Still, Xeno heavy weapons teams could be seen setting up in ruins flanking a mass of warriors charging in from a side street. Deffkoptas had also been spotted. 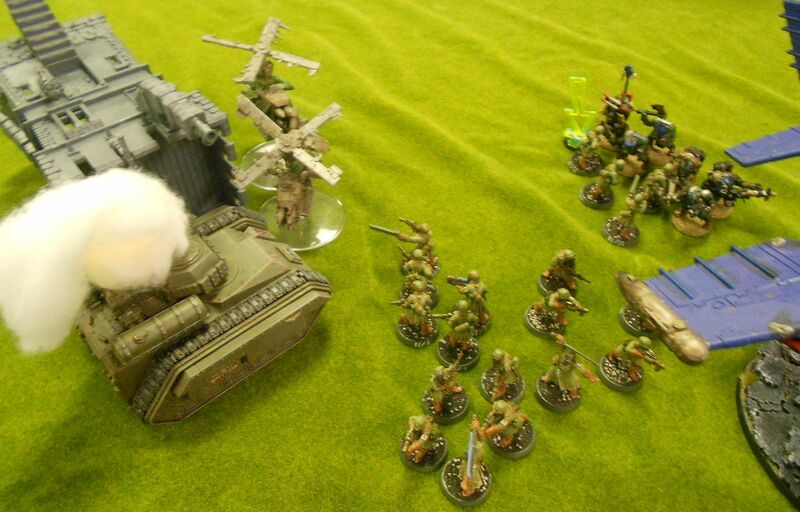 The guardsmen heard the hum of the motors, they counted the rotors, and waited for the Orks to arrive. Boys charge towards the relic, while koptas move up and pepper the hellhound with rokkits, stripping two hull points but leaving it fully operational. 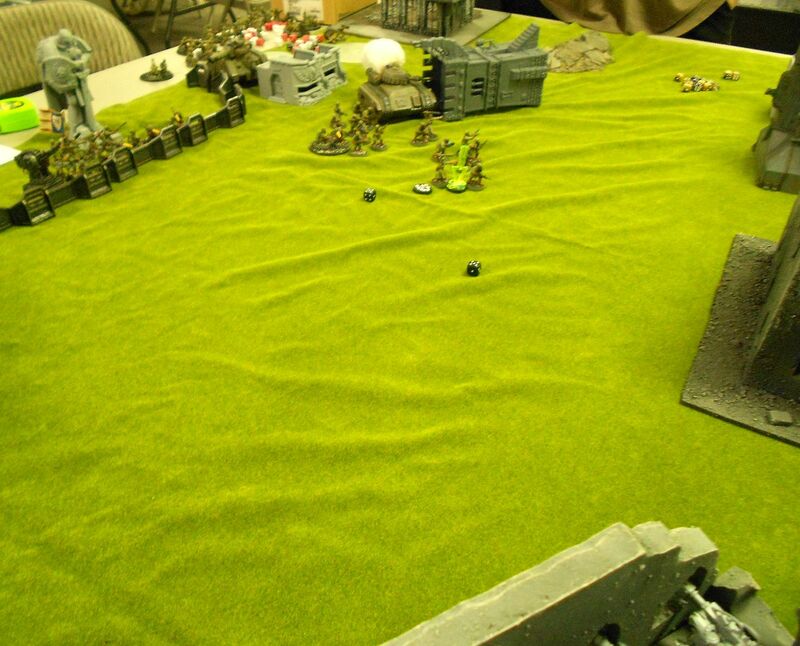 Guardsmen charge out to meet the Orks while they and their fellows holding the line pour concentrated fire into the boys mob, piling up bodies in the street. The hellhound and russ take out two koptas and force the others to flee. They soon rally and return to cause more trouble. The Orks were being forced back for now. Even the storm was started to clear up in this area. If only it would remain so for a while longer perhaps air support could be called in - given the interference, few pilots were crazy enough to try to fly, grounding the regiment's valkyries. 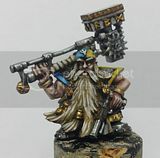 But some Ork pilots were plenty crazy, riding the storms like a surfer riding waves. 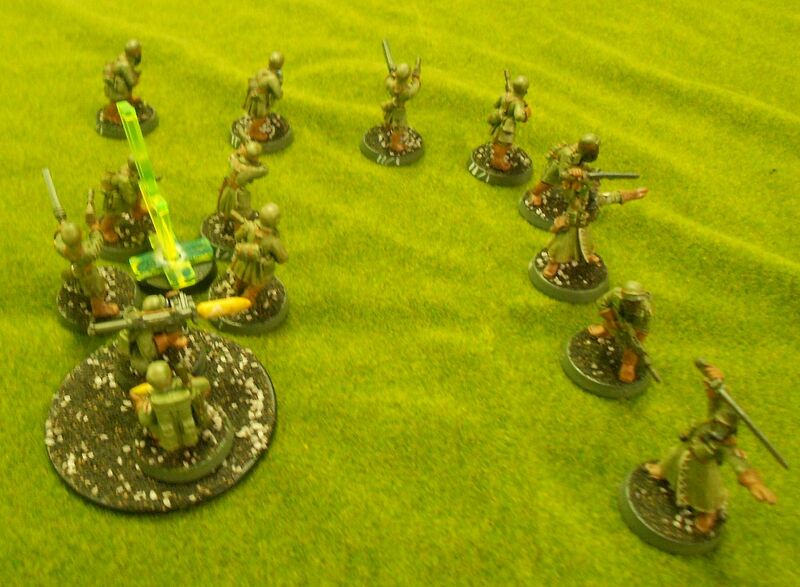 Most didn't last long, and those that did often had trouble finding their bases again. Still, some made it through at least long enough to harry the Imperials. A blue meteor shot down from the sky as though released from the storm's grip as it parted. Imperial fire rose to meet it, but the fighter avoided it all, bucking and weaving in an airframe-bending display that threatened to tear it apart even if it avoided its attacker's direct efforts. Either the pilot was amazingly adept at evasive maneuvers, or was a terrible flyer, unable to control his craft but exceptionally lucky. 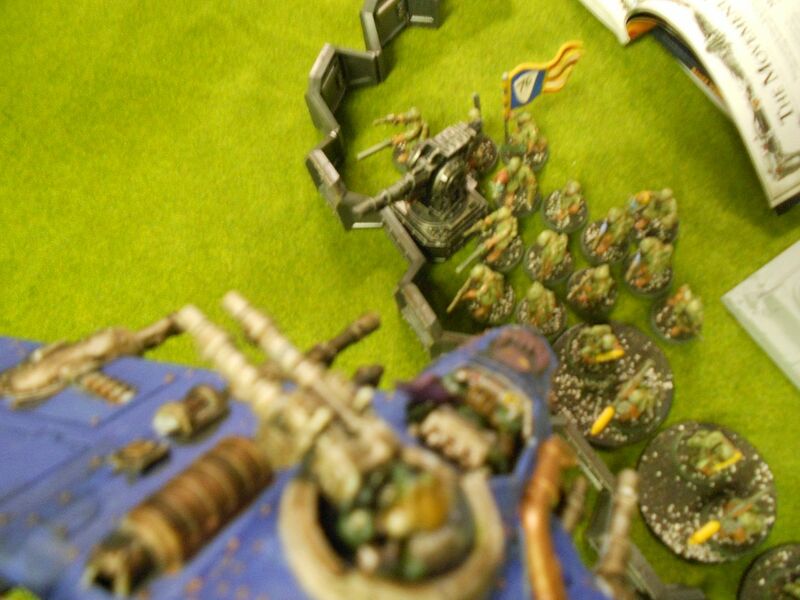 The Orks get up close to the relic, and the dakkajet arrives, starting to shoot up some guys in the open, as do the lootas. The IG lights up the sky and scores a number of hits but the dakkajet evades them all. 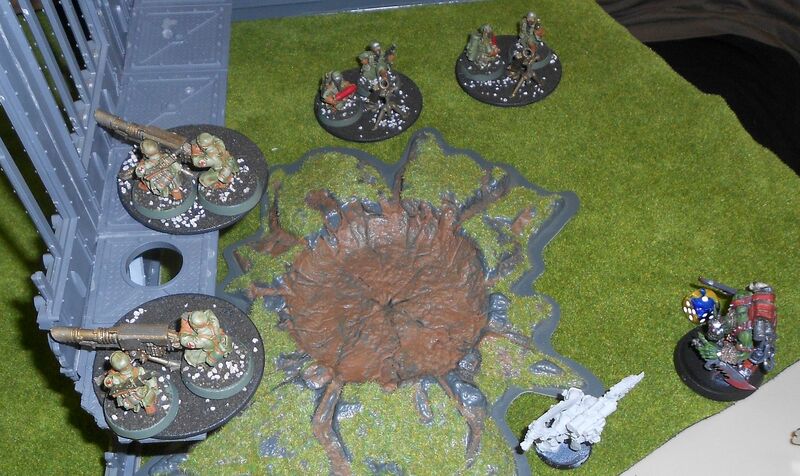 ,,,which promptly explodes, killing a number of Orks and a few weapon teams. 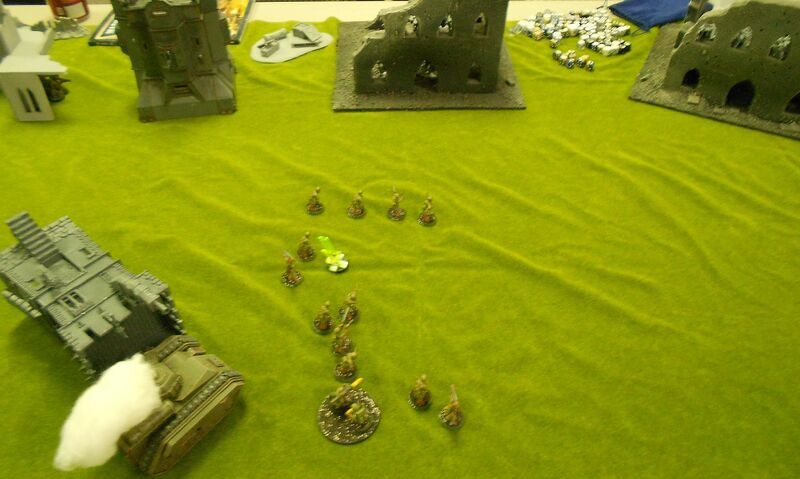 Mortars turn and fire point blank on the kommandos, killing four more, leaving just one kommando and Snikrot. Moe Berg climbs up out of the sewers and heaves a demolition charge at the Orks peppering the guard troops with autocannon fire. The lootas have chosen solid firing positions however and only two die from the blast. He survives return fire and charges in to try to take pressure off of the squads moving up in the open and slays three more before being pulled down in the pile of Orks. Still corkscrewing wildly, the Ork fighter dives in on the Imperial position, blasting several guardsmen apart in a blaze of shells. In the middle, a scrum develops over the relic between depleted guard squads and the depleted boys. 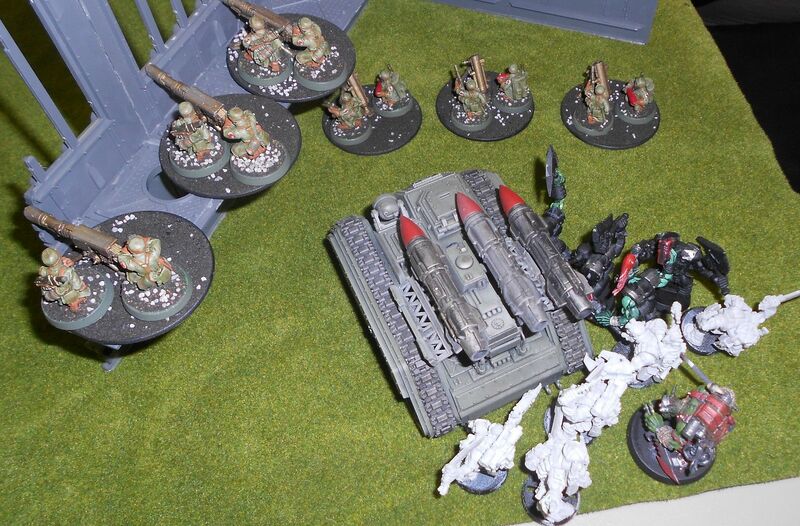 Koptas finish off the Hellhound. 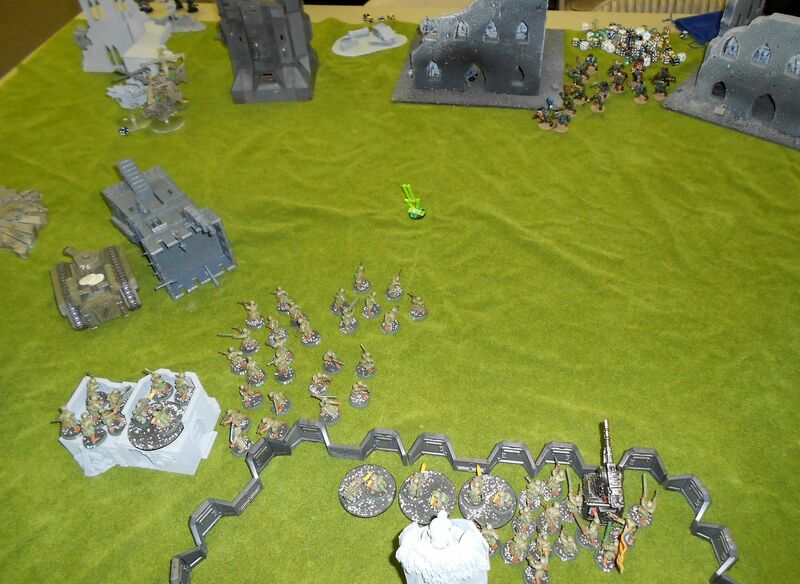 On the right, Snikrot and his last meatshield kommando charge into the mortars. 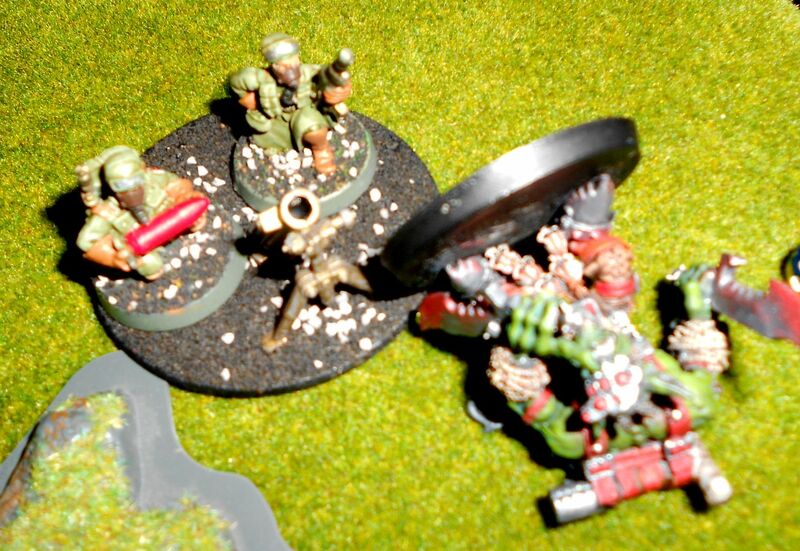 Snikky carves one team apart, but the other one gets desperate and lucky with a contact-fused hand-thrown HE shell to the chest of the massive greenskin, winning the assault! Their success is short lived, as the warboss' battlewagon, following the trail the kommandos blazed rolls in and over the mortar team. 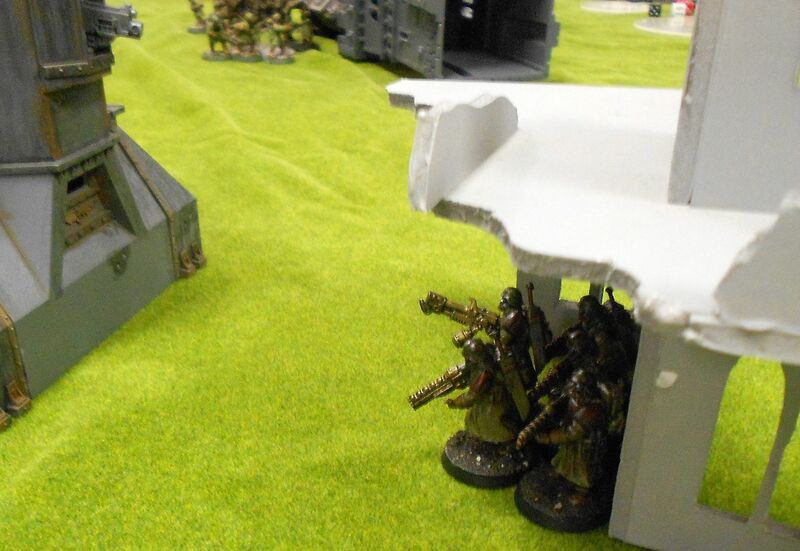 They manage to avoid the deathrolla, but wisely flee before the nobs can disembark or the big shootas can draw a bead on them. 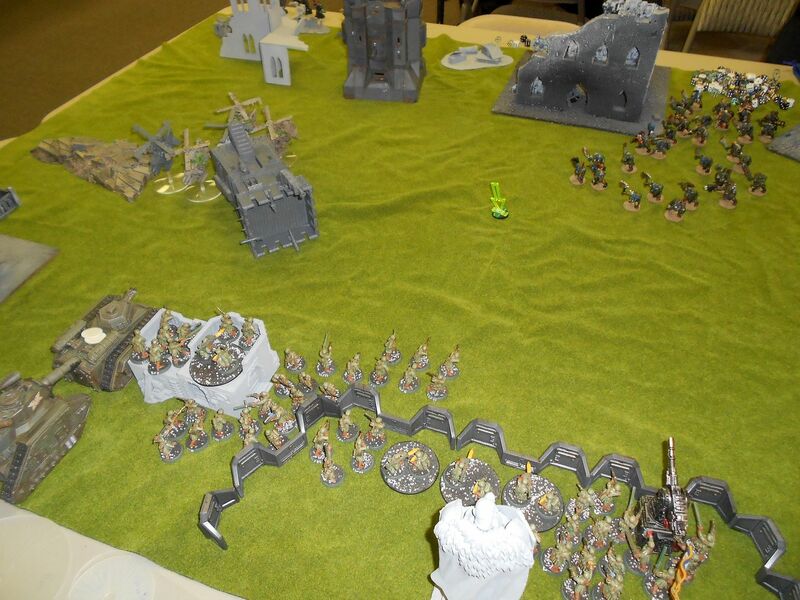 The Orks in the middle are wiped out, and the guard squads caught in the open keep getting hammered by loota fire. Do they have enough bodies to hold out? The Russ starts to move out to get better fire lanes against the nobs and also to block the view of at least some of the lootas, but gets caught up and immobilized trying to drive over the fortifications. 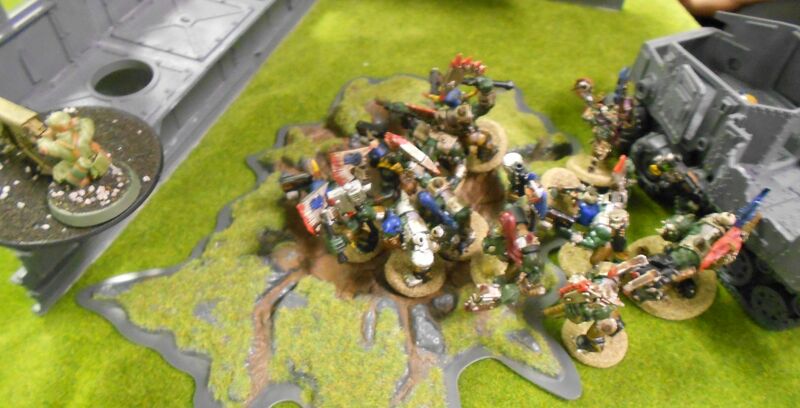 The Ork fighter finally gets shot down, robbing them of significant firepower. Squads get killed or forced to fall back, but others move up to take their place. Forming walls with their own bodies and pouring covering fire into the lootas, squads protect the unit with the device. Plugging the servo-skull into place and reciting the entreaties printed out for him by the engineseer, Sgt. Carson presses the activation rune on the homer. 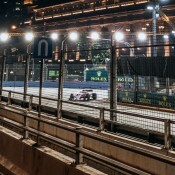 His efforts are rewarded by hums and clicks from the skull and a red light on the device switching over to blinking green. Soon hulking forms of superhuman Astartes in tactical dreadnought armor begin appearing amid cracks of thunder and lightning, the report of their storm bolters adding to the din as they engage and drive the Orks back. The xenos would now face the fury of a true storm; the wrath of the Space Marines. Victory for the Guard! 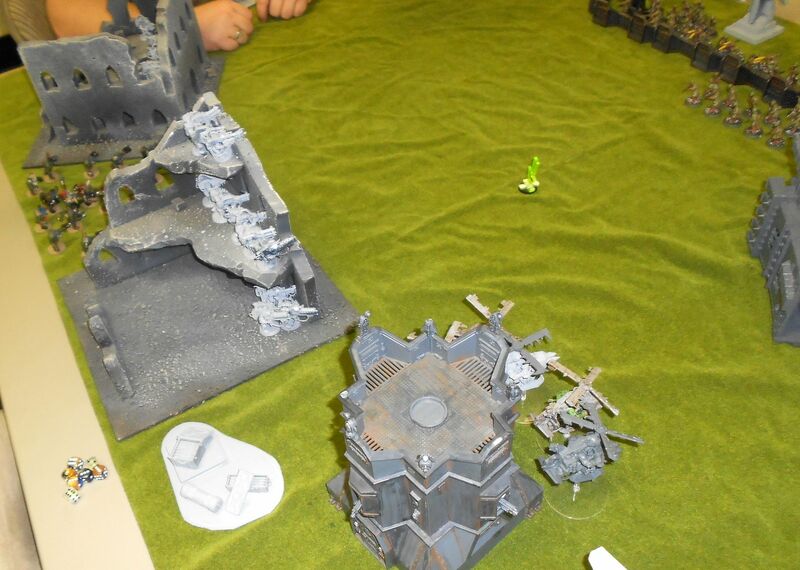 I held the Relic (3pts) at the end, and had Linebreaker thanks to the stormtroopers for a total of 4 points. Leonard had First Blood and Linebreaker from the Nobs. Neither of us managed to kill the others' warlord. Fun game, with some unexpected results. I was puzzled that Leonard chose to outflank with the battlewagon and nobs, thinking that he should have just thrown them at the middle from the outset. Had they arrived earlier they might have rolled up the back line, and I understand not wanting to expose them early on to the manticore and russ, so it might have worked out. As it was, I was able to just annihilate his boys mob, leaving him hoping to just keep the relic neutral and win on secondaries, but the limitless supply of bodies to catch deffgun rounds proved too much.